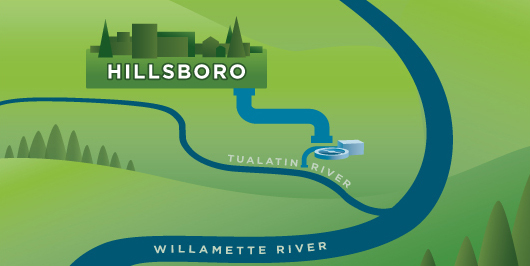 This option would construct a drinking water treatment plant downstream of the Clean Water Services' Durham Wastewater Treatment Plant to capture the expanded flows from discharges to the lower Tualatin River. Obtaining municipal water in this manner is safely practiced throughout the United States. If selected, this water source would supplement current drinking water supplies from Hagg Lake and Barney Reservoir. As population increases in Washington County, it is expected that discharges will increase from Clean Water Services wastewater treatment facilities. This option would capture those highly treated discharges and further treat them at a newly constructed drinking water treatment plant. Clean Water Services treats waste water to the highest levels provided for under Oregon law. Additionally, a state-of-the-art drinking water treatment plant would be built to ensure water quality is similar to other options. The Study contemplates additional analysis of the water quality potential of this option and the results are expected in the fall of 2011. Initial estimates have rated the costs of this option high. If water is determined to be available from this source year-round, then the Study will further develop more precise cost estimates. A drinking water treatment plant would have to be constructed on the lower Tualatin River to accommodate this option. Additional source storage is not required under this option. Treated water would continue to be stored throughout the JWC distribution systems in agency-owned reservoirs. Some of the water would also be injected and stored in aquifers during the winter. The water would then be recovered and used during the summer. This project has significant regulatory hurdles with regard to water rights and water availability issues. Under Oregon water law, it will be difficult to capture discharged water for new beneficial water uses because the lower Tualatin River is already over-allocated in the summer. For that reason, and also because of the fact that new discharges are contractually guaranteed to the Tualatin Valley Irrigation District, the Study has determined that obtaining sufficient water supplies from this source is highly risky. As a result, this option may not receive further exploration under the Study. Land use approvals for siting a new drinking water plant in the Durham area of Washington County would have to be obtained. This may or may not be difficult depending on the exact location. Reclaimed water is regulated by the Department of Environmental Quality in the state of Oregon. These regulations are generally applied to the use of treated wastewater for agricultural irrigation and not for drinking water purposes. The Study will have to assess whether these regulations can be adapted for drinking water purposes. The Durham Treatment Plant Option was eliminated before the final ratings and criteria evaluation was done. The iniitial investigation revealed that there would not be enough water produced at this site to meet Hillsboro's needs for the next 50 year planning period. This is the only potential source that was entirely eliminated as an option, due to the fatal flaw of water supply deficiencies.